This trip has been on my bucket list for 10 years. Last year I finally decided to make it happen. The view was everything you could expect but my overall experience was so much more than I anticipated. When you add in the people that I met, the exceptional guides and the high quality/diversity of the food; it far exceeded my expectations. Sleeping under the stars the constellations were unbelievably beautiful. The food was surprisingly good to me and different every day: steaks, fajitas, Italian food, curry chicken, bean salad, tuna salad, eggs Benedict, blueberry pancakes, fruit every meal that is cut up freshly, vegetables every meal that are cut fresh, desserts like cake, banana fosters (yeah, we actually had ice cream! ), cheesecake, carrot cake and on and on.... Just awesome food! Our guides: truly fantastic! Kelly, Ben, Corey and Curt were just awesome. Whether it was Kelly playing a wooden flute in the mountains after a long hike, Ben with another witty comment or joke, Curt taking pictures for everyone, any of them helping someone with something or their unbelievable knowledge of the history, geology, plants, animals and people involved with the Grand Canyon, you couldn't possibly ask for more. 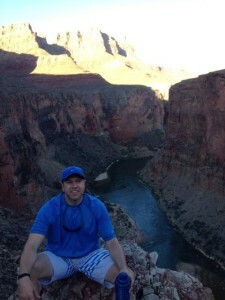 I loved this Grand Canyon rafting trip and it wasn't just a vacation or a raft trip. It was the experience of a lifetime and I have made friends from the trip that I will see again. My only disappointment is that my wife and children weren't on the trip with me. I fully expect to come back again to share it with them in the next few years.